Why should you visit Greenland? Where should I begin? Never have I ever been so blown away with nature as I was on this trip. This massive island in the Arctic is something very special; it’s spectacular, to say the least. It will WOW you and leave you speechless. Most importantly, it will steal your heart and heal your soul. 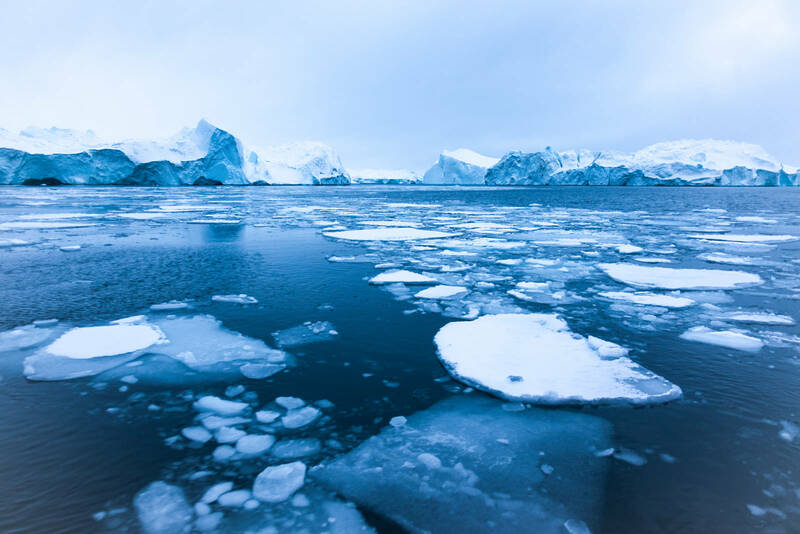 If you had no plan to visit Greenland, I strongly urge you to read this article and consider revising your travel plans to include a visit to Greenland this year. My husband Siya and I started our Greenland adventure in Copenhagen, Denmark. This is one of three ways you can fly to the island. The other two options are through Reykjavik in Iceland or Iqaluit in Canada. 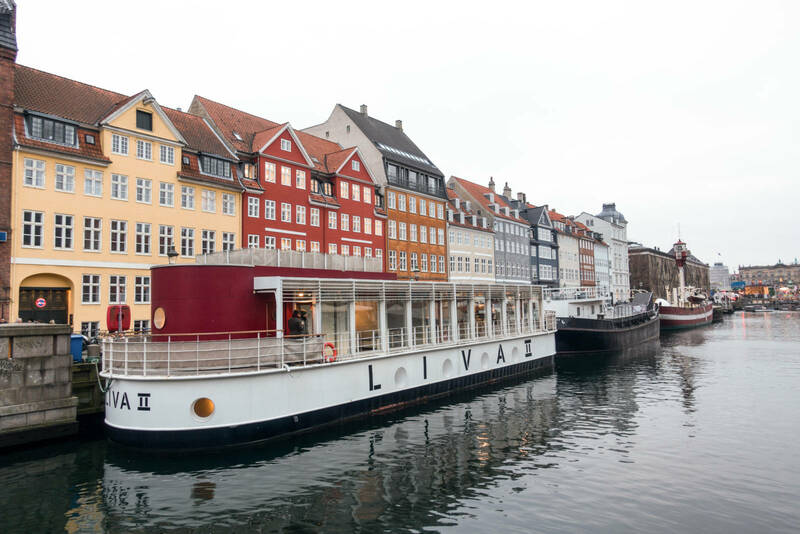 We chose Copenhagen as it was the cheapest and more frequent option coming from Toronto. From Copenhagen, we flew to Kangerlussuaq, where we had a short-turned-long layover before flying to Nuuk, a great place to visit in Greenland and it's capital city. Here, we met journalists and videographers who also be joining us on our journey. 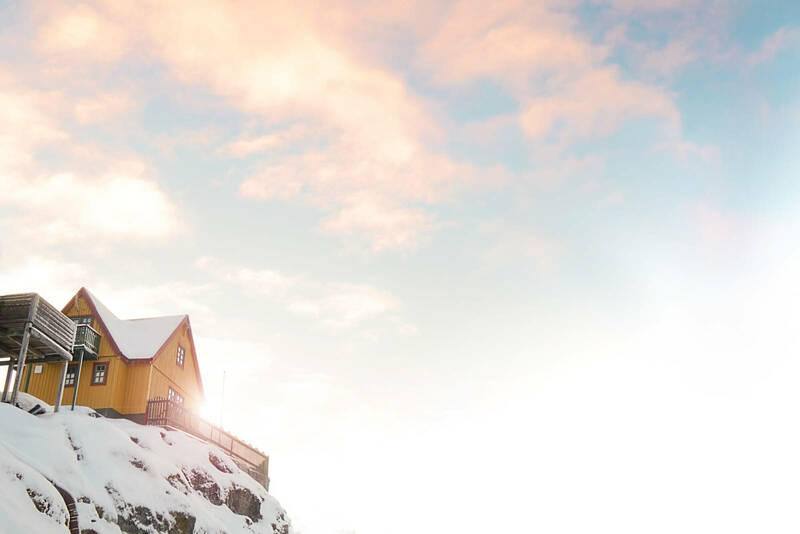 Now, there’s one thing you must know about Greenland and that is to never expect a flight to depart on time, especially in December. Weather conditions can get pretty crazy, very quickly in the Arctic, so patience is key when you flying to and from anywhere in Greenland. During our layover, we took a short tour around the city of Kangerlussuaq, population 500, where we saw wild Muskox and reindeer casually walking through the snow. 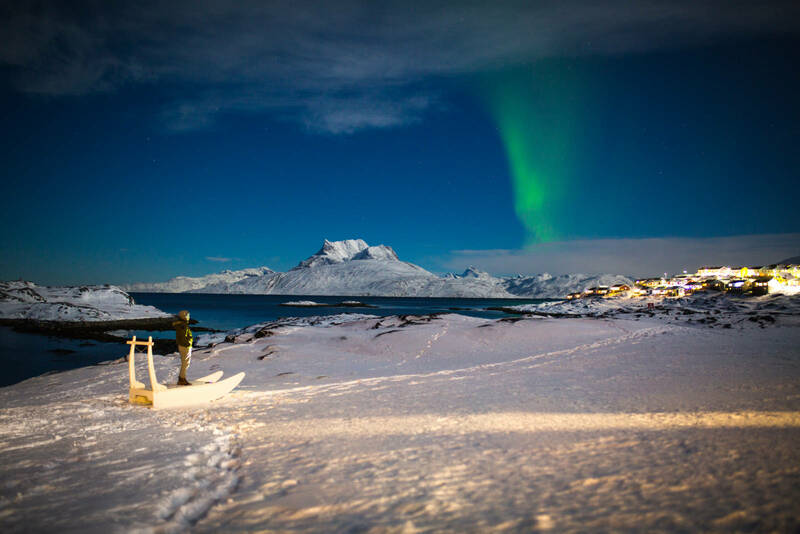 Our adventure really kicked off upon our arrival in Nuuk. Our first full day in the capital of Greenland was spent touring around the town. 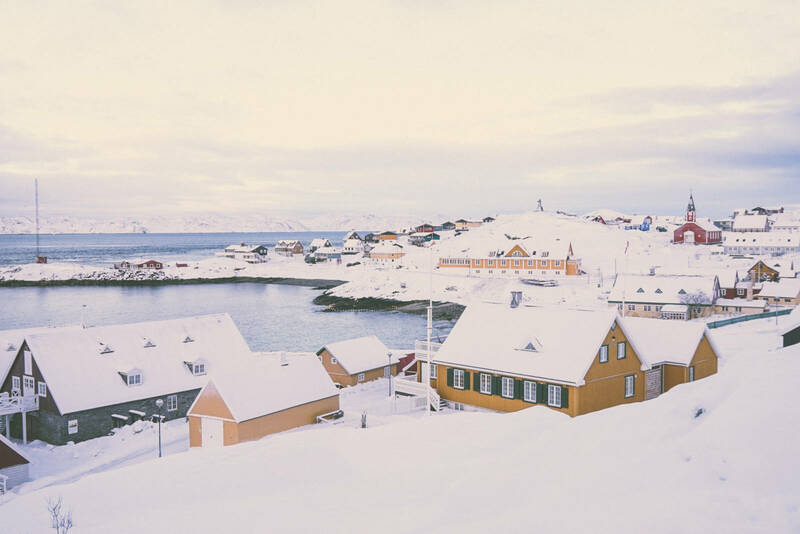 I quickly understood why the town is referred to as "colourful Nuuk" with houses and buildings painted shades of yellow, red, blue and green. 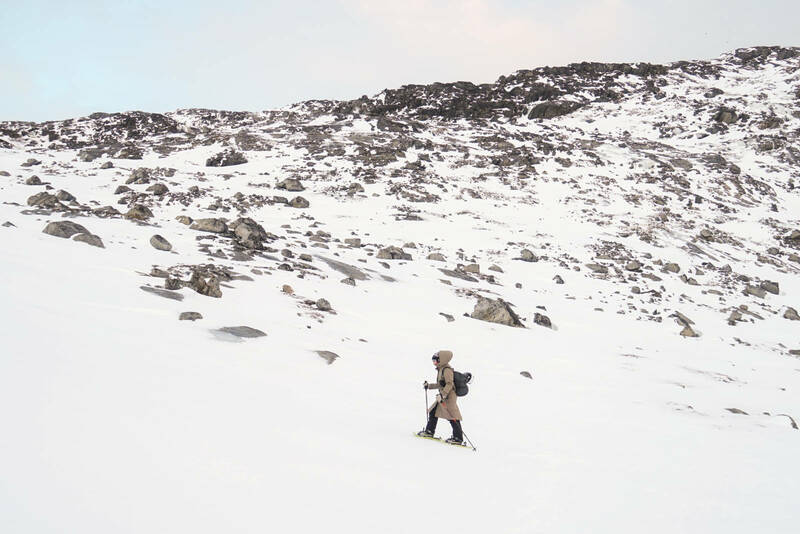 Our hardest activity in Greenland was snowshoeing for 7 hours through the mountains. One hour in, things took a turn for the worse when I pulled both of my inner groin muscles making every step excruciating. Rather than giving up and turning back, I asked the mountains for strength and made it through with a smile on my face. When you're amongst ancient mountains that have battled millions of storms you feel their power. During the months of October to February, Greenland experiences what's referred to as "polar nights." The sunlight diminishes quickly during the day and continues until the darkest evening of the year on the 21st of December. After the Winter Solstice, however, the light returns rapidly to Greenland and becomes slightly brighter every day until the days of the midnight sun. It was an adjustment to the long dark days. I don't think I could ever get used to it, but I did appreciate the warm, homey feel it gave me. The darkness combined with the chill air was comforting and renewing; it was just the natural medicine I needed. 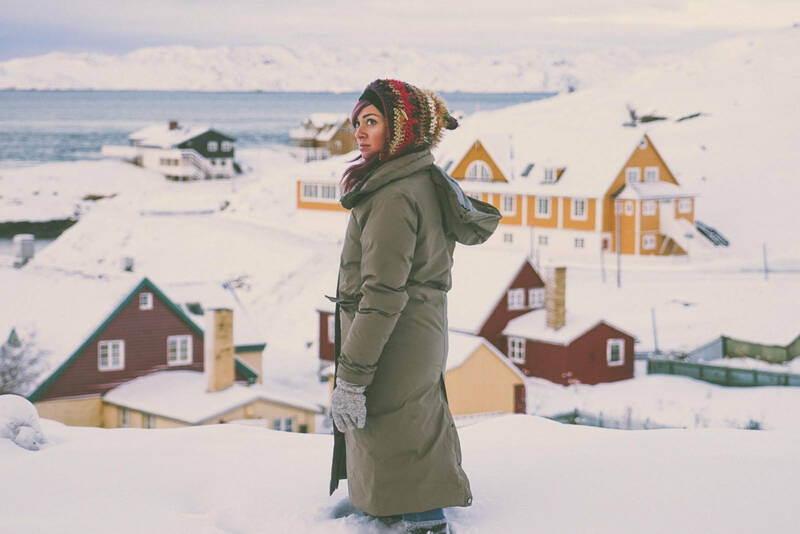 During my time in Nuuk, I experienced one of the best days of my life. The magical day was spent on the Arctic waters sailing through the fjords and exploring a nearby village. On this trip, I saw my first iceberg! I even got to bite into a piece of an iceberg which tasted salty fresh. I then had the honour to touch a 3.8 billion-year-old rock and drink the purest water I'll ever have in my life from a glacier waterfall. Our days in Ilulissat were spent dogsledding with one of Greenland's top mushers and sailing through 40 meter high icebergs. 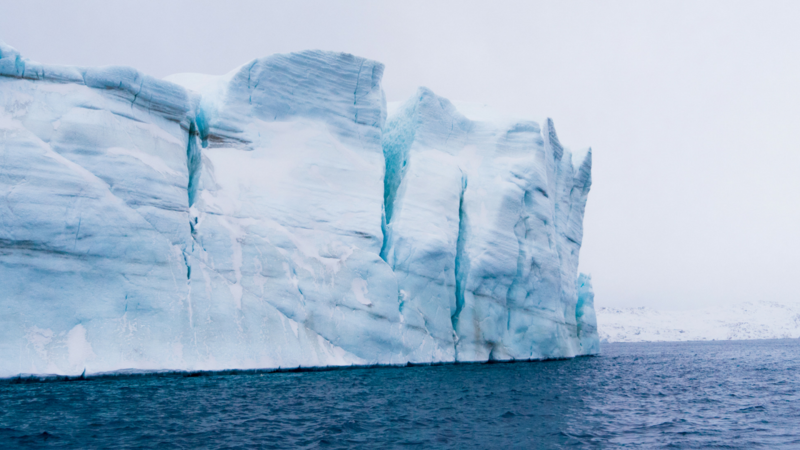 There haven't been many times in my life where I've been speechless, but the icebergs of Ilulissat left me without words. I tried vlogging several times, failing with no words to express my amazement, gratitude, and love. Many times, my body was overcome with goosebumps from head to toe and my eyes filled with tears from pure joy and awe. Yet again, I experienced another top day of my life that I will forever think back to. Visiting Greenland is not cheap, but few places combine such magnificent scenery and raw power of nature. It's one of those once-in-a-lifetime experiences that have the power to change your world. I can talk from experience, that it absolutely changed mine. Be sure to check out our daily videos from our entire stay in Greenland. Just click play on the video below and each day will play back-to-back. Greenland was one of the most wonderful places….. I absolutely loved the post and the video. Recently I went to Iceland and I was amazed by the icebergs and the natural beauty of that place. Now Greenland is on my list! Greenland was one of the most breathtaking places I think I’ll ever see. It’s one of those trips that stays with you on another level. Just so much natural beauty and people living such a different way. I’d read so many posts on Iceland but not so much on Greenland. Probably it’s a good time to visit since it’s less popular now… Love you videos by the way! Ahh Greenland is definitely in my top 5 places to visit. Have you read Cold Earth? No I haven’t. Is it worth the read? I ultimately enjoyed all of the videos on Greenland. I can see how privileged and honoured you felt. The views looked breathtaking and I\\\’m sure you got to breath in the most freshest of air. I loved the dogs, I would never of thought them to so friendly. This experience must of felt surreal at times. Gotta love our amazing planet how offers endless beauty to leave us in awe.